The dispensary I go to in Georgetown MA is having a great deal tomorrow 4/14 from 12-4pm. You can get a custom engraved Pax Era for $1 with the purchase of any pod. I also found a dispensary in MA that delivers and they have a pretty solid list of Pax Era pods. Definitely another option for me for the upcoming warmer weather! Those pods are phenomenal. I just found a shop near me that has them for $35 instead of $60. I'm stoked to grab a couple more! better than a good 510 cart on a mod? If so, in what way? The ones near me are a half gram of live resin. Definitely very expensive, but well worth $35 in my opinion. They tend to last longer than distillate carts, taste better, and I need less hits to actually feel it. Plus, I find it effects me differently than the distillate ones! I went to Liberty Cannabis in Somerville, MA a few weeks ago and “recycled” an old freebie 510 battery for a free Pax Era battery dealio they have going on just to check ‘em out. I picked up a pod, too, and I have to say, it’s a pretty slick system. Super stealthy, single degree adjustable temp, hits great, no threads, droppable/durable, good battery life and battery level indicator... what’s not to like? Well, they tend to be more expensive than reg carts and they only come in .5 gm or smaller sizes. See, now that confuses me. We have Liberty here...as does @rockytdogg and I have spoke to their lab chemist. Liberty makes GREAT live resins in various consistencies....sugar, badder, diamonds and sauce, etc. But for carts, they tell me that to get the consistency and cleanliness they then distill the live resin into components, add back to the THCa the terps that they want, and then put it into a cart. The only other alternative that I know of (that is, non-cutting agent alternative) is sup crit CO2 extraction. But I'm pretty sure that they told me that they recombine afterward also. So, what exactly is live resin in a viscosity suitable for carts and clean enough to not plug up the ceramic wick/heaters? Its a rhetorical question (well, unless you actually know! hahaha) but I always feel that these terms bandied about by dispensaries are so inexact and ill defined as to be useless if not in some cases misleading. Liberty here in MD also sells the Pax Era but I haven't tried one yet. In Colorado some places are selling the Era(battery) for $15 and two non pax pods for $70. Might grab one(just the era) just to have but I’m not to fond of carts in general as they usually give me a headache. The Pax Era pods use dual silica wicks. They’re not ceramic and I think the fact there’s two is what allows them to keep from clogging very much. Wow, $15 is very inexpensive for an Era cart, right? Cool beans. Thank you....didn't know that. So, are they subject to the wick burning and tasting crappy the way old cotton wick carts were? Do you know at all? I don’t typically prefer carts with silica wicks as I, personally, don’t like how they tend to affect the flavor compared to ceramic carts. In fact, I was convinced that the market was pretty much shifting from plastic/metal/silica cart assemblies to glass/metal/ceramic carts. But after trying the Pax pods I find myself back on the “meh” train because I really enjoy the pax/pod combination. The Era really makes for a very nice battery with a clean and functional app. I also enjoy the overall quality of the concentrate in the few, very pricy, pax pods I have gotten my hands on. I reckon that paying for licensing rights from Pax tends to influence the distributors to use higher quality material in the pods. It’s just the battery part, I have seen them free with a pod but yea $15 works for me. I’m at the Monster energy supercross race in Denver. I saw 4 people toking on a pax while in line to get in. The Era is a good device that has an app to let you set the temperature. The flavor is amazing, it would make sense that they reconstitute it. Because they taste too good to be true. I have had a Tangie cart that would blow your mind. It was like sucking on a tangerine. I also had a Brownie Scout cart that also had a phenomenal flavor profile. You can find these free and cheap batteries occasionally from different shops, or you can order the pen itself directly from PAX. My place has a deal if you bought two carts at $50 they gave you a free battery. There is hardly any draw resistance and if you crank it up you can rip some huge clouds. Overall it’s a great device, I wish I could find empty carts. There is a supplier on Ali but he won’t sell just empty carts and wants to sell in quantity. I don’t need 500 carts. Or to get ripped off trying to buy 500. I couple sources close to my area have the Era....head shop places....they want $30 for just the battery. I just ordered from Pax direct for $15 and free first class shipping. I can get Mary's medical .5g carts for it for $45. I will get some carts soon and see how I like it over the normal 510 carts I use now. But...I will be going to a totally different concentrate source...so its sort of not fair in that respect to compare. But hardware wise I'm sure the Era will be good. Not sure if I like the app deal....but we'll see. Ok....got all setup and plugging along with a Lemon Pie and a Durban P pod. I like this thing....just on low power it hits well. I just need to score some 3:1 CBD/THC pods now. Ya I love mine. Super happy with it. I have a couple Animal Blurs pods that are 45% THC 30% CBD, excellent all around. Excellent!!! Pax pods or 3rd party? I have only seen 3rd party be $35 and you had to buy two for $70 to get them at that and it was a special limited time offer! CA or Nevada tax on top of that ? Or $35 all in ? I got 2 for $70 as well (MI)....some listed on w-maps show 1g pods.....anyone ever see one? If you find 1g let me know. Then I will start searching for them here! Oh wow. Never been there, I go to Healthy Pharms in Georgetown and they are 75 there. I may have to drive down to Somerville though. In Good Health in Brockton has a delivery service that I signed up for, but they are 70 there. I don't like the idea of spending $80 for a strain pod and usually wait for deals on the flavored pods that run $50. With Greenlabs deal yesterday the flavored pods were $37.50 ea. The flavored pods are still on the higher end of the THC scale which is why I can't see spending $80 for a named strain. 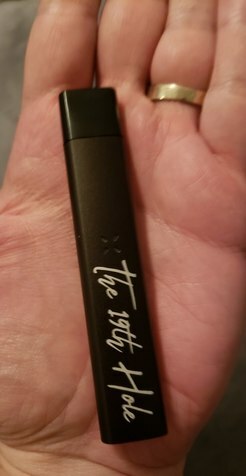 The Mango pods are tasty and are 78% THC. Anyway, the 510 carts just don't do it for me for some reason which is why I was reluctant to pull the trigger on the Pax Pods. I'm glad I did. Try one. Curio is running a 10% deal this week with a free Era if you buy three pods. HC.....$70 for a 1/2g pod? Nice.....I just figured out the 2 inlet air/carb holes....cool to use them and left off like a dynavap...cause I don't use a dynavap like that ever...only with water. I really like being able to tailor the vapor as needed or how I like it. Super nice compared to finicky 510 carts so far for me. In MI.... a few sell 3- pods for $110 or 2 for $75. They are just slackers and don't use the internet well when they put up stock info...lol That is just the price if you buy 2 .5g pods. So I do not think Pax has ever designed a 1g pod most likely. There was a push in MI to have only .5g carts and no 1g ones. Not sure how this will be sorted out when our "state rules" are finalized with 100% compliance by June 1, 2019. Even better deal if you stack your veteran discount code on. It's like that sweet sweet deal on the Costco printer and the ink costs more than the printer, now to buy some Era pods for $652 a pop. lol no doubt.... thanks for your service TTC ! I would like it so much more if it was able to stand itself up and be more of a smaller box rather than the tall can barely stand up pen style that it is. It is also so much easier to carry in pockets if it was not so long....I just want to carry it so the oil remains upright. Or....does the pod system work so good they never leak and it does not matter what position the pod is stored in or between uses? I have not used it enough to drain a pod down yet to tell....nor have I seen any leaking issues with them in non-upright positions....so far. In MI. We have Mary's Medicinal with the Pax Pod system. The grower/processor for them is in Jackson MI (Choice). I actually got mine there and did not know at the time they are the producers of the oils for Mary's Medicinal Pox pods. They also have really good GG4 flower at a low price....I was super happy with that visit to say the least! Good people too......Choice on Page in Jackson...not the other store they have there. 20% for vets? That's nice. I get 15% routinely for being senior or vet, but one really great dispensary gives me 22% for being a vet. Love them. I was USAF, what service where you in? Anyone puffed on a pax era? Pax 3 oil canister grooves broke lose....Pax replaced it.